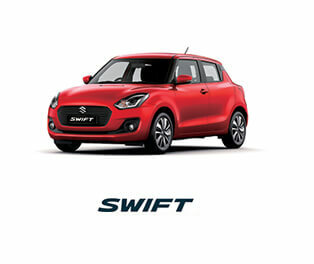 Suzuki has revived an old name for a new SUV model that compars well with the S-Cross. The first Suzuki Vitara I drove, about 20 years ago, was as tough as a recruit’s army boots, rough on the move and sparsely equipped. It did not even have an anti-lock braking system (ABS). The latest Vitara has ABS, state-of-the-art RBS (Radar Brake Support, which employs radar to prevent or mitigate a collision with the vehicle in front) and adaptive cruise control. These and other modern features make the Vitaras of the late 1980s and early 1990s seem even more like rough old boots. And the new-age Vitara is handsome. Unlike the first-generation model, whose rugged appearance – complete with a “backpack” spare tyre on the tailgate – was almost incidental, the newest edition was meant to look outdoorsy from the get-go. Therefore, its boxy shape is “supported” by good ground clearance, a solid clamshell bonnet, substantial pillars and strong-looking bumpers. More importantly for the style-conscious crossover crowd, the chunky Vitara comes in funky colours. The funkiest paint jobs for the car are Atlantis Turquoise and Horizon Orange, with a choice of black or white (or monotone body colour) for the roof and side mirror caps. Different trims for the front grille and four fenders give the trendy buyer more options, while the blue projector covers for the LED main headlamps provide extra design chic. And there is a tailgate-spoiler option for those who wish to add more “sport” to this sport utility vehicle. There is also a “rugged package” of skidplates and other forms of bodywork protection to satisfy the adventure seeker or poseur. If the adventure involves suburban outskirts with patches of slippery ground, the Vitara will be ready, thanks to its AllGrip 4x4. A similar driveline is in the S-Cross, but the one in the Vitara is an improved version – its All-Grip is able to predict front wheelspin and divert torque to the rear axle even before it occurs. The result is all the grip needed for multi-storey “hills” in a concrete jungle and during low-impact suburban excursions. I take the car through a short off-road course and it is a walk in the park. Driving the Vitara in Cascais is easy too. Road surfaces made harsh by cracked tarmac and protruding manhole covers litter this coastal area of Portugal, so the car’s suspension, with 215/55 R17 tyres, is challenged frequently. The Vitara’s general stability and steering accuracy are obvious, but any pliancy in the ride is evident only on smoothly paved motorways. 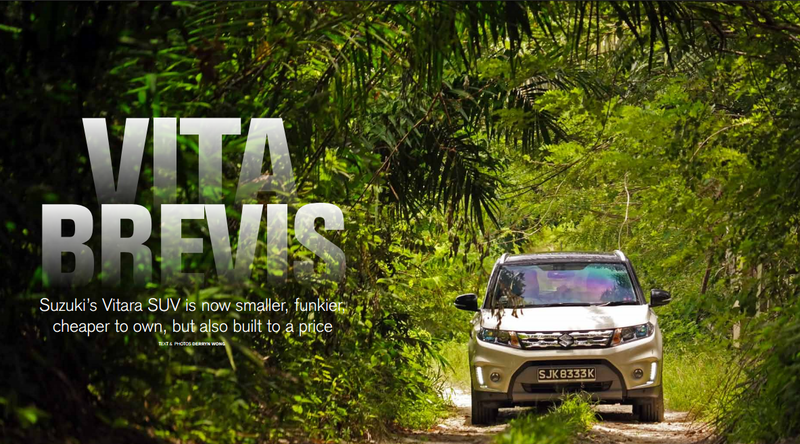 There is noticeable wind noise from just 100kmh, but a bigger surprise is the eagerness of the Vitara’s 1.6-litre engine during a full-throttle rush towards the 180kmh top speed. Surprising, too, is the responsiveness of the six-speed automatic gearbox, which comes with paddle shifters. The Vitara is a livelier drive than the S-Cross, but does not sound sportier. 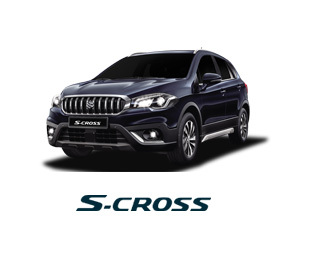 Both Suzukis have the same M16 engine and their kerb weight figures are just a few kilograms apart, so it is probably the transmission (the S-Cross uses a less responsive continuously variable transmission) that accounts for the performance difference. Behind the wheel of the Vitara, the driving position is like that of the S-Cross, but elevated. Too bad the materials and construction quality of the cockpit environment have not been elevated above the basic standard of the S-Cross. For instance, none of the cabin plastics is soft to the touch and the doors need a hard tug to close properly. The dashboard is where the Vitara scores against its S-Cross sibling, even though they share switches, fixtures, lights and instruments. The Vitara dashboard has been given a designer clock, with a choice of three distinctive dials, one of which has Japanese kanji characters; attractive air outlets and a decorative finish, with a choice of colours. The Vitara’s front seats are broader and more supportive than those in the S-Cross and the upholstery is nice. Nicer still is the 7-inch infotainment touchscreen. It is speedy, user-friendly and compatible with today’s multi-tasking smartphones. Satellite navigation and a rear-view camera function are built neatly into the system. In terms of interior space and exterior size, the Vitara is comparable to the S-Cross. It is roomy enough for four adult occupants, but the rear seatback may be too upright for passengers who prefer to slouch. Despite the Vitara’s SUV vocation, its level of utility is no better than average, with a smaller boot (375 litres) than the S-Cross (430 litres), a strangely narrow glovebox (with half its space taken up by the owner’s manual) and too few stowage points for loose items. 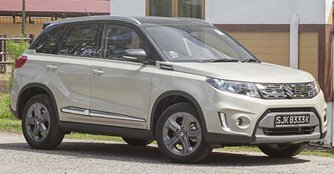 Comparing the Vitara with the S-Cross is unavoidable because they have a lot in common – mechanics, dimensions, off-roading pretensions and country of manufacture (Hungary). 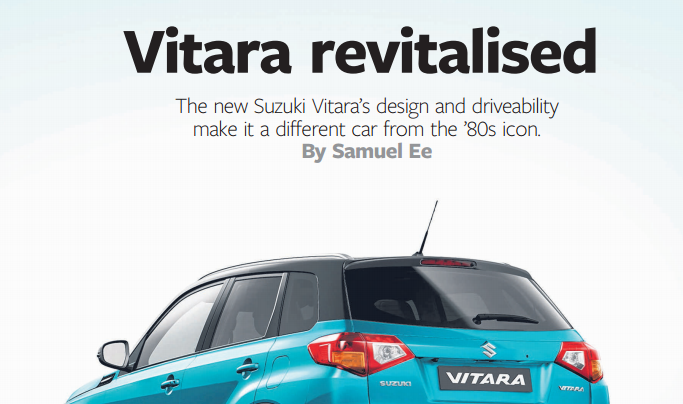 The pricing strategy for the 2015 Vitara was not revealed at press time, but the new-generation Suzuki SUV is expected to cost a little more than the equivalent S-Cross model when it comes to Singapore in the third quarter of this year. The writer is the editor of Torque, a motoring monthly published by SPH Magazines. 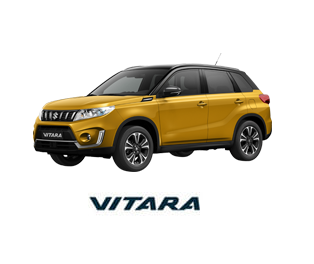 The latest Vitara has anti-lock braking system, state-of-the-art radar brake support and adaptive cruise control. © 1975-2017 Champion Motors Pte Ltd. All Rights Reserved. Details & specifications may differ from actual. Champion Motors reserve the right to change price, colour materials, equipment and specifications without notice.